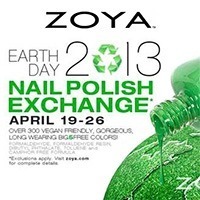 Beautiful Incentives: ZOYA coupon code for Earth Day 2013-$4 a bottle! Plus, recycle your old nail polish bottles! ZOYA coupon code for Earth Day 2013-$4 a bottle! Plus, recycle your old nail polish bottles! While you are doing your spring cleaning, why not clean out your nail polish collection and do something good for Earth Day and yourself? Switch to Cruelty Free and 5FREE (Free of Formaldehyde, Formaldehyde Resin, Toluene, DBP and Camphor) To further support our Earth with less harmful chemicals. Don't pass up this opportunity to get up to 24 $4 bottles of ZOYA! From April 19, 2013 - April 26, 2013 (11:59PM EST), exchange your old colors for non-toxic ZOYA Nail Polish for only $4 per bottle plus shipping and handling. ZOYA will even properly dispose of your bottles for you! From 04/10/13 – 04/26/13 you can use code ZOYAEARTH2013 at ZOYA to get a 50% discount! 6 bottles must be bought and no more than 24 bottles of polish. Go to ZOYA and pick out your must have polishes (excludes all Zoya PixieDust™ Collection shades) and add them to your cart. You should see all the discounts reflected if you picked at least 6 bottles! Have fun! There are so many gorgeous colors out right now!